I'm looking to write an implementation that's compatible with OpenCV data structures. This means that an off-the-shelf Matlab solution isn't an option. However, I found the Matlab documentation on image deblurring to be quite helpful in understanding the general principles, as well as this site. The Matlab functions are all computationally-intensive in any case, and I wasn't able to pick an estimated point-spread function (PSR) that gave good results. What are your suggestions for a fast deblurring algorithm that allows features to be distinguished easily by a subsequent threshold? You only need to find and report positions of nine specific symbols. 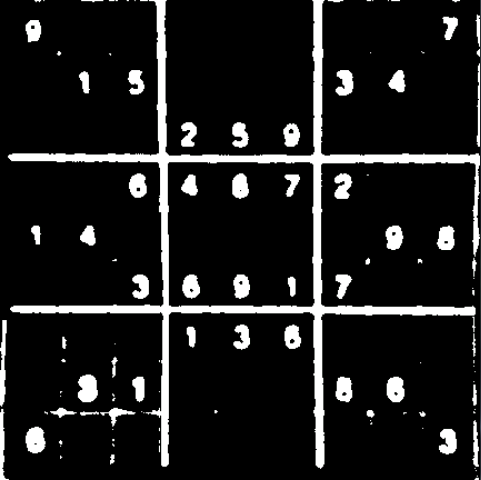 You can do this by computing correlations (done quickly by multiplying in Fourier space) with samples of the nine digits snipped from a typical puzzle image, blurred as it is. All blurred '9' will look the same, and likewise all other digits. 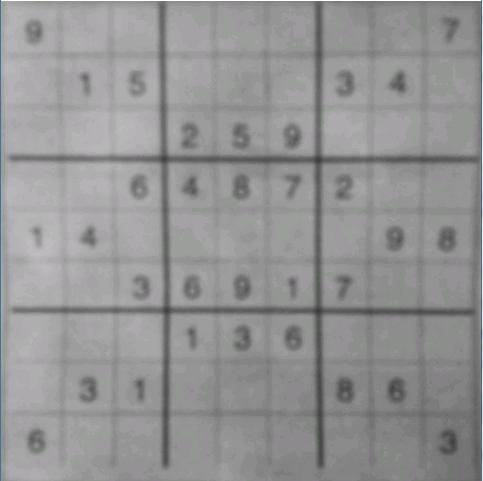 I'm assuming puzzle images are taken with the same camera the same way. It might work better working on high-pass filtered versions of the input puzzle image and image snips, by subtracting from each a more-blurred copy. Not the answer you're looking for? Browse other questions tagged image-processing thresholding deconvolution blur blind-deconvolution or ask your own question.